An upgrade to your backup camera system offers you more convenience and easier travels. 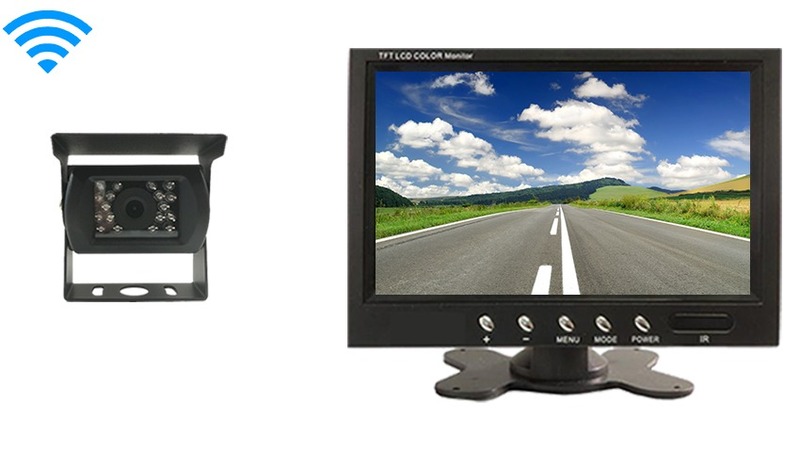 The 9" Monitor with Wireless CCD Mounted RV Backup Camera gives you more confidence when driving, paired with the clearest picture possible. The 9" Monitor with Wireless CCD Mounted RV Backup Camera has a large screen so you are guaranteed to see every detail as it’s captured. Two video inputs allow you to connect extra cameras, a DVD player, or gaming console.Connect this camera to any power source, and search for other cameras from Tadi Brothers to work into your backup camera system - everything that we sell is compatible! We understand that you are looking for a camera that you can take anywhere. This waterproof RV camera is our most durable camera and will be your partner on any excursion. Tough sands, direct hits from rocks, and torrential storms are not a problem for this reliable piece of equipment. With a 120° viewable angle, you will see everything that stands between you and a perfect park job. This camera is designed for individual use or can be paired with multiple other RV box cameras. Best of all, this camera is wireless up to 70ft, so you don’t have to deal with any extra annoying cables or cords. Join the many other Tadi Brothers’ customers who have gained a sense of awareness and safety from the use of our camera kits with this multi-featured system. This wireless camera has a 70ft range that can go through any vehicle. Also, This system, like most of our vehicular products that have an LCD screen, can be used for video gaming, Considering that a perk or bonus for purchasing our back up system (others block that feature).